On Thursday, April 11, 2013 a few of the RJE employees joined Sam Julka with DORIS on a tour of the new Alexander Hotel in downtown Indianapolis. This was an exciting opportunity, not only because the hotel is brand new, but also because it's the newest hot spot (even for locals). We were lucky enough to get a tour from Becca Manolov from Buckingham Companies. She has had a hand on the development of this project since it's conceptualization a couple of years ago. She gave us some great insight on what went into the planning and realization of this property. We were instantly intrigued by the collection of artwork displayed strategically throughout the space. It was later revealed that 12 pieces were created for the hotel by artists. Everything felt so customized. From the lighting, to the sculptures to the paintings and murals, we could tell that every last detail was thought of. There were lounge areas, restaurants, bars and even 'pop up stores' for people on-the-go who were attending conferences. 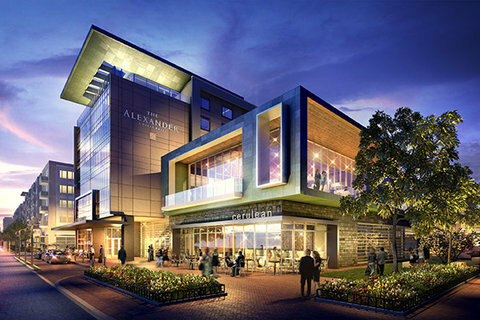 The Alexander did an outstanding job of incorporating elements from Indianapolis into the design, including the old railroad ties (so cool!). We think our city will be really well represented to anyone who visits and stays at this hotel. 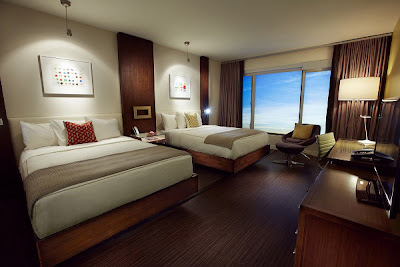 Becca Manolov took us to see one of the rooms on the top floors of the hotel. The views were awesome. She explained the future construction that would take place across the street - and it's even going to have a YMCA. The room looked like it belonged in a magazine! Although the bathroom looked so clean and simple, they had a lot of complaints about its functionality. When they designed the space, they were aiming for a European feel, which looks cool and is fun to talk about - but when it came down to actually using the facilities, it wasn't convenient at all for a busy traveler. So at the end of the day, this aspect of the hotel wasn't designed with its audience in mind, but rather for the aesthetic appeal. We can't really blame them though! Perhaps changing things from their classical interpretation doesn't really solve any problems, but causes them instead. Sometimes a classic is a classic for a reason. After the tour, we couldn't help but think about this discussion - and how it relates to what we do every day at work. Knoll Studio is known for their classic pieces of furniture. Why re-invent everything to be so modern and new, when these incredible chairs were created by celebrated architects and designers from around the world? "Life changes, but quality endures". Overall, this was an incredible experience, and we would love to go back and learn more about this development. The space is intriguing and encourages conversations about the city. We can't wait to see what they come up with next!